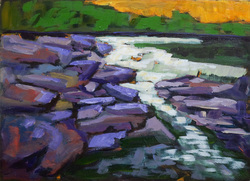 Four-day Art Retreat in the La Cloche Mountain / Killarney area of Ontario, Canada with Keith Thirgood. Keith paints in a post-impressionist style and is especially good at helping artists loosen-up and paint more freely and expressively. Your weekend in the resort begins Saturday evening, after check in, with an orientation session and a discussion about locations, reductionism and the art of plein air painting. Sunday morning at 9 am it's off, by pontoon boat, to the first location. (No boating experience necessary.) This is the Canadian Near North. Many of the locations can be reached only by boat. You get down to painting right away, taking advantage of the morning light. At noon, Keith will give a demo, then lunch, a short break and back to some serious painting for the rest of the day. Monday we begin the day with painting a new location in the morning, a demo at noon, followed by more individual painting with Keith on hand for guidance and problem solving. Tuesday we head off to a new location, a new demo and more gorgeous scenery. Wednesday morning, more of the same and Thursday morning we head home. Scroll to the bottom of the page to see shots of the area. In the shared cabins, some are single rooms with one bed, others are shared rooms with two beds. If your spouse is accompanying you, they share the room and bed. If you are accompanied by a non-painting friend, please call to discuss as there are no separate beds. To reduce cost, this year the retreat is a self-catered affair. Each cabin has is own kitchen, plus there is a large kitchen in one cabin where we can take communal meals. This way individuals can prepare the food of their choice. $250 deposit required to hold your place. Full payment must be received by August 5, 2017 to hold your booking. Payment: To pay by cheque, make it payable to Wilson Street Studio, 277 Sunset Blvd., Peterborough, ON K9H 5L2. If you want to pay by VISA or Mastercard, call us (647-551-3387​) and we will send you a form to mail to us. If you want to pay cash, you can only do so in person. 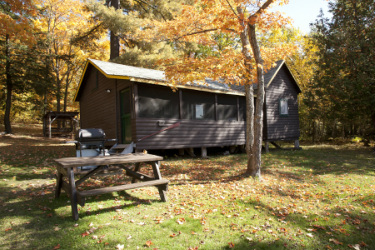 Fees are based upon shared occupancy in north country cabins. LIMITED TO 7 STUDENTS ONLY: BOOK SOON! For this you get your accommodation for the four days, five evenings, instruction, water transportation to and from painting locations (Not available to non-artists), a studio space in case of inclement weather and fantastic scenery. If you're interested in other plein air classes, or just want to be kept up to date, click here to send us an e-mail and we'll put you on our announcement list. Remember to tell us which retreat you're interested in. You can use this same link if you want more information or if you simply want to get on the Wilson Street Studio mailing list. 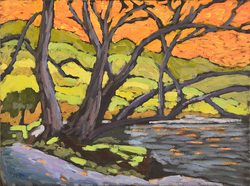 For the non-painting spouse and friends, the La Cloche / Killarney area is a stunning destinations. It's a photographer's paradise as well as a painters. And there's hiking, fishing, canoeing, and dozens of other things to enjoy.